The brethren came to Abba Anthony and laid before him a passage from Leviticus. The old man went out into the desert, secretly followed by Abba Ammonas, who knew that this was his custom. Abba Anthony went a long way off and stood there praying, crying in a loud voice, “God, send Moses, to make me understand this saying,” Then there came a voice speaking with him. Abba Ammonas said that although he heard the voice speaking with him, he could not understand what it said. Abba Anthony was born about 50 years after the death of St. Irenaeus of Lyons, who lived from 130 – 202 AD. St. Irenaeus is a towering figure in the early history of the Church. He was a student of St. Polycarp of Smyrna, and St. Polycarp himself was a disciple of the Apostle John. Among his many accomplishments, Irenaeus emphasized the importance of apostolic succession in matters of church organization and teachings, and he helped to shape the accepted canon of New Testament writings. Much of his energy was spent arguing against the gnostic Christians and the several heresies they endorsed concerning Christ and the human person. The gnostics were well known for supporting their un-orthodox teachings by quoting Scripture out of context. They were masters at what Evangelical Christians call “proof texting.” In proof texting, if I cannot find a text or verse in the Bible to “prove” my point of view, then it is not a teaching of the Church. Proof texting, in general, is a dangerous practice. This is a lesson the Orthodox learned long ago from Irenaeus and his confrontations with the gnostics. Scripture is more than a collection of texts. It has a structure and an internal logic that cannot be neglected. They [the gnostics] … strive to weave ropes of sand, while they endeavour to adapt with an air of probability to their own peculiar assertions the parables of the Lord, the sayings of the prophets, and the words of the apostles, in order that their scheme may not seem altogether without support. In doing so, however, they disregard the order and the connection of the Scriptures, and so far as in them lies, dismember and destroy the truth. By transferring passages, and dressing them up anew, and making one thing out of another, they succeed in deluding many through their wicked art in adapting the oracles of the Lord to their opinions (Against Heresies, I.1.7). Their manner of acting is just as if one, when a beautiful image of a king has been constructed by some skillful artist out of precious jewels, should then take this likeness of the man all to pieces, should rearrange the gems, and so fit them together as to make them into the form of a dog or of a fox, and … should deceive the ignorant who had no conception what a king’s form was like, and persuade them that that miserable likeness of the fox was, in fact, the beautiful image of the king (Against Heresies, I.1.7). According to Irenaeus (and following the Apostle Paul in 1 Corinthians 15), the correct interpretation of Scripture must always be consistent with the “canon of faith” which places Christ and his saving death on the Cross at the center of all we believe and preach. The gnostics ignored the canon of faith. There was no place for Christ and his Cross in their teachings. And so their proof-texting is nothing more than a “wicked art,” as Irenaeus notes. Abba Anthony stands firmly in the tradition set forth and defended by St Irenaeus. To understand a difficult passage in Leviticus, Abba Anthony does not begin by saying “In my opinion …” He begins with silence, and then he moves on to appeal to correct authority. In this case, to Moses himself! Anthony’s approach to Scripture must be ours as well. The interpretation of Scripture is not the action of an individual, it is the action of the entire Church. Scripture cannot be bent to satisfy our personal beliefs and projects at the expense of marring the image of Christ and him crucified. This is not to say that a given passage of Scripture has a single meaning, fixed from of old. That would also be a heresy! Scripture is the living word of God. The Gospel is timeless, for certain, but Christ speaks a new and relevant word to his Church in every age and in every place. The Bible, according to Orthodoxy, cannot be understood correctly outside the Church. Again, this does not mean that certain individuals in the Church have the authority to say exactly what a passage does or does not mean — they don’t. Such authority belongs to the Church as a whole, whenever and wherever it exists. As such, the meaning of Scripture — what we believe it says — must be tested again and again. If what “I think” Scripture says departs from the Church’s commitment to the saving death of Christ on the Cross, then what I think is wrong. When I hear people say that they do not need to go to Church to pray, I often agree. (That’s a reflection for another time.) But if you want to read your Bible, and understand it correctly, you most certainly have to go to Church. Put another way: if you’re going to stop going to church, you may as well donate your Bible to the parish library at your final visit. Illumine our hearts, O Master who loves mankind, with the pure light of your divine knowledge. Open the eyes of our mind to the understanding of your gospel teachings, and implant also in us the fear of your blessed commandments. Today is the Monday before Christmas. The feast of Christ’s birth is six days away. Today we are presented with a choice. Either we will let the wider culture have its way and this will be the loudest week of the year — six days of uninterrupted shopping, shipping, schlepping, and schmoozing. Or, we will follow the lead of the Church and allow this week to be the most peaceful of the year — six days of patient waiting for the gift of the promised Savior. In Saying 27, we hear of three monks who make an annual trip to see Abba Anthony. Two of the brothers fill their time with words. Much has happened during the year, and they must pack a great deal of information into the available time. And no doubt these two Fathers walk away satisfied and full of joy. They are grateful for the blessing of Anthony’s wise counsel. “I waited patiently for the LORD; he inclined to me and heard my cry” (Psalm 40:1). “The LORD will fight for you, and you have only to be still” (Exodus 14:14). “I will take my stand to watch, and station myself on the tower, and look forth to see what he will say to me” (Habakkuk 2:1). “They who wait for the LORD shall renew their strength, they shall mount up with wings like eagles, they shall run and not be weary, they shall walk and not faint” (Isaiah 40:31). “And Jesus said to them, ‘Come away by yourselves to a lonely place, and rest a while.’ For many were coming and going, and they had no leisure even to eat (Mark 6:31). Sometimes it is enough to stand in the presence of God and breathe. It is enough to see rather than to speak, as the third brother says. This week before Christmas is to be such a week. If we are noisy, the holidays may be happy, but will the Feast be full of “peace and good will” (Luke 2:14)? Probably not. Are you late to the Nativity Fast? That’s ok. It’s never too late to have a good Advent. These next six days are just for you! These next six days are days on which the Lord calls us to acquire “eyes to see and ears to hear” (Matthew 13:15-17). In the weeks leading up to Christmas Day, we see billboards and bumper stickers proclaiming that “Jesus is the reason for the season.” As Orthodox Christians, we can certainly agree. Christmas is the celebration of the birth of the eternal Son of God in human form. But we should be quick to add that the reason for the season is the *purpose* of Jesus, not just the person of Jesus. Our Lord was born so that He might be crucified for our sake. 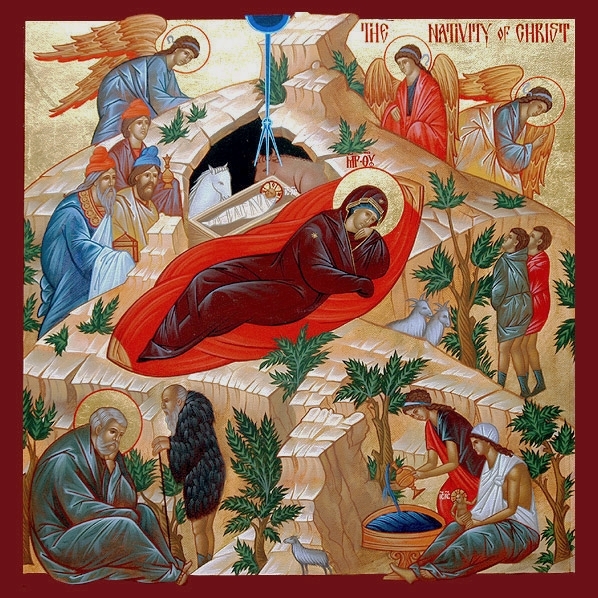 Spend some time looking at the icon of Christmas. In the icon one can see that, in the mind of the Church, the shadow of the crucifixion falls across the brightness of Christmas Day. Look first at the infant Jesus. He is wrapped in a burial shroud — this is adornment for the dead, not for a king! Look next at our Lord’s manger. The newly born Son of God rests in a space carved from rock — the stable in which he sleeps is depicted as a tomb! And finally look at the Theotokos. In most icons of the Nativity, Mary looks away from Christ. Knowing in her heart the fate which awaits her Son, she gazes with sadness in the opposite direction. The Nativity of our Lord is closely connected to His Passion. And so it is important that we prepare for Christmas, just as we prepare for Holy Week and Pascha. For this reason, the Church gives us the 40 days of Advent. The Church asks us both to slow down and quiet down — to abstain from certain foods, to devote more time to prayer and study, and to increase our charitable giving and service. We are to prepare for the Nativity of Christ by reflecting on our need for the saving grace which is granted to us through his birth, death, and resurrection. Too often we are slaves to appetite, activity, and accumulation. And so the Church asks us to take on the challenging tasks of fasting, prayer, and charity! Yes, we may fail to live up to all the demands of the Nativity Fast, but our failures are priceless reminders that we need Christ – that we are powerless to save ourselves. They said that a certain old man asked God to let him see the Fathers and he saw them all except Abba Anthony. So he asked his guide, “Where is Abba Anthony?” He told him in reply that in the place where God is, there Anthony would be. Today is the Tuesday before Christmas. We are waiting for the day on which this earth and all creation becomes the place “where God is,” as the guide says of Abba Anthony’s own location. With the birth of Christ, God completes his search for us. No longer will he call after his lost children saying, “Where are you?” as he does when he discovers that Adam and Eve are no longer there in Paradise to walk by his side (Genesis 3:9). Anthony the Great always stood before the Throne of the Father. Whether he was at prayer in church, laboring to feed himself and his brothers, or receiving pilgrims, Anthony was always aware of the awesome and loving presence of God. This is what puts “the Great” into “Anthony the Great.” Through Christ, he was healed of the wounds by which we were grieved in the Garden of Eden. When we chose to eat of the forbidden tree, we decided that in fact we did not need God. We chose to believe instead the beguiling lies of the serpent: that we could become Gods on our own. But the force of our separation from God did not lead to divine life — it led to total death. And the separation became one that we could not close on our own. It is Christ who closes the gap. Being born as a human being, he joins himself to us. He shares our humanity — death-bound and wounded as it is — so that he might then share his divine life with us. Divine life that heals all wounds, self-inflicted and inherited. Abba Anthony the Great has said “yes” to this offer of divine life. And now where God is, there also is Anthony. But he is Anthony the Great, not “the Greatest.” And neither is his “yes” to God the most significant. These distinctions belong to Mary, the Theotokos. We call her Panagia (pah-nuh-GEE-uh), a Greek title that means All Holy or Most Holy. Mary was always aware of the nearness of the God of Israel, and her “yes” to the Archangel Gabriel as a young woman is the most important “yes” in the history of the cosmos. “Let it be to me according to your word,” she said, allowing all who sit in darkness to see the great light of Christ (Luke 1:38). Last Saturday we were blessed by a visit from Father Chad Hatfield of St Vladimir’s Orthodox Seminary. He led us in an Advent retreat entitled “Mary, Mysteries, and Mission: Orthodox Christian Basics.” In his first talk, Father Chad reflects on the need for Mary and the role played by her in God’s plan for our salvation. The talk is now posted on our YouTube page. If you could not attend, find the hour needed to watch this first reflection by Father Chad. He walks us from the pages of Genesis to the life of Mary. Pause and listen once again (or for the first time) to what we believe about the Mother of God. The effort will be rewarding, and will sharpen your joy on Christmas day that much more!